Count me among those who have never seen Cool Hand Luke. It's true. But as I watched the footage from my interviews with Luke and Marvin Mathis, that's what was rattling around in my head. Why? Well, two reasons. Second, of all the kids I interviewed at the Hoop Shoot Finals last April, Luke was the most comfortable on camera. He was cool. California cool. Luke works out with his dad at the Springfield Boys and Girls Club. During Hoop Shoot season, Luke shot 450 free throws per day. "Sometimes nothin' can be a real cool hand." For context, watch the scene here. Newman delivers the line at 2:15 if you're impatient. I think his point in that scene is that it's easier to perform when you have nothing to lose. For me, though, in the context of the Hoop Shoot and the Mathis interviews, the quote played perfectly with Marvin's refrain. 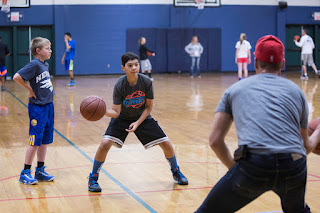 A Real Cool Hand opens with Marvin declaring that regardless of what happens in the Finals, Luke cannot lose the characteristics he's developed through the Hoop Shoot program. He circles back to that point around the one-minute mark, tying drive, determination and dedication to future success. "It's going to help him be successful in anything he does in life," Marvin says. In his first appearance on screen, Luke explains that this is his third year in the contest. In his first year, he made it to District. The next year, he reached Regionals, where he lost by one. And this year, he made it all the way to the National Finals. By working harder. By shooting 450 free throws per day. Marvin drives the point home one final time: "Whether he walks home with a trophy or not Saturday afternoon, he's already a champion." That's not the self-esteem movement run amok. "Every kid's a winner." That's the frank assessment of a parent who over three years, has watched his son's drive, dedication and determination develop through our program, and he knows that those traits will help Luke on and off the court for the rest of his life. Luke hit 21 out 25 on Saturday afternoon. He walked away with nothing. But sometimes nothing can be a real cool hand. In case you haven't seen it yet, here's A Real Cool Hand. This is the first time i have read this blog and it brings back great memories of the event. My son made it back to regional again last year and lost by one shot. Yet, he was back in the gym the next morning working on his shot wanting it to be perfect. No amount of trophies or accolades will ever make me prouder of my son then his hard work, determination, and drive. The attributes he has developed will serve him well past the time when the awards are but dusty relics put away in the attic. He is going back to state contest, for the 4th straight year, next month and wants to win but realizes that in life that you do not always win. He understands that losing is sometimes a personal win as it forces you to look at yourself and make adjustments. This from a 12 year old! So thank you ELKS for all you do, for all you contribute to our youth. It is appreciated more than you will ever know.